While many of our programs are at the graduate level, EOS proudly supports undergraduate research and creativity. To learn more about undergraduate research at UNH visit Undergraduate Research Opportunities Program. UNH is ranked a "high-impact university" in forestry, geoscience, and environmental science citations. ScienceWatch (ESI) has listed UNH as #1 in "citation impact" for forestry (2004-08) and geoscience (1997-2001) publications. In a review of citations for climate change research papers 1999-2009, and ecology and environmental science papers 2005-2009, UNH has been in the company of NASA, NOAA, NCAR, Stanford, Columbia, and Princeton for the top-ranked international institutions. EOS researchers figure prominently in contributing to all rankings. UNH and the Institute for the Study of Earth, Oceans and Space (EOS) offer graduate research alongside internationally recognized faculty. Our students can be found in relatively unexplored places like the ice fields of Greenland, deep ocean ridges and the far reaches of outer space. Graduate study in EOS falls under Earth Systems Science, Space Science, Marine Science, or through the Marine School of Science and Ocean Engineering. Graduate students conduct their research under the auspices of EOS, yet they earn degrees in the traditional academic programs of Physics, Earth Sciences, Natural Resources, Oceanography, or Zoology. Students have access to the academic resources of UNH's College of Engineering and Physical Science and the College of Life Sciences and Agriculture, as well as courses specific to EOS. 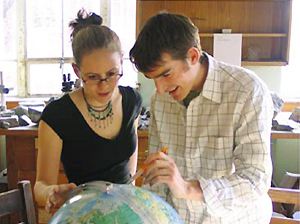 At the Ph.D. level, many students access the interdisciplinary program in Natural Resources and Earth System Science. EOS Course Offerings by semester . . . Requirements and degree-related information can be found in the UNH Graduate catalog.